759 Replacements Join 25th Div. The pulsing beat of Schofield Barracks, slowed briefly with the departure of elements of the Tropic Lightning Division to Viet-Nam, suddenly came alive Saturday morning as the 25th Inf. Div. said Aloha to 759 enlisted replacements at Honolulu. The new incoming personnel mark the largest group of troops received by the Hawaiian division since January 1965, when more than 900 men were assigned here as replacements. The men, who have just completed basic combat training and advanced individual training, were moved in 23 buses from dockside to Schofield Barracks in less than two hours. The fresh troops, drawn from 13 training centers throughout the United States, received a true Hawaiian welcome as their ship docked at Honolulu. 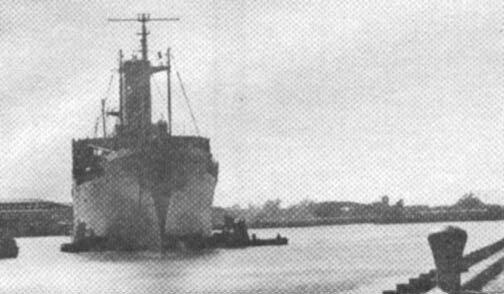 Assisted by two tugboats, the U. S. Navy troop transport churned into Pier 40 as the melody of "Sweet Aloha" by the 25th Inf. Div. Band echoed on the wharf. Hawaiian dances were performed by the Luci Lee Hula Maids as the soldiers waited to debark. Brig. 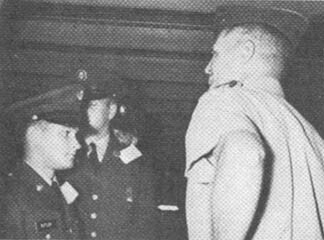 Gen. Edward H. de Saussure, ADC/S, spoke to the new troops on board ship. "We're real proud to have all of you. We have a good training program waiting for you, so get ready to go to work," General de Saussure told the men. On Tuesday morning, the new replacements were welcomed by Maj. Gen. Fred C. Weyand, CG, 25th Inf. Div. Men assemble in hold for topside movement. 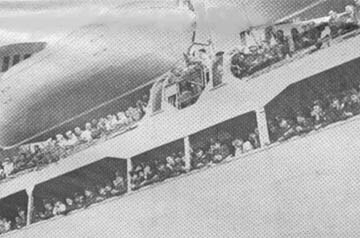 The ardent tropical sun neared high noon as 759 troops in dress greens lined the deck of a U.S. Navy troop ship in Honolulu Harbor. "Ce-ripes, is it hot!" vibrated one of the green mass. "You're tell'en me," another belched. "All right, knock it off." "Hey Sarge," a soldier shouted, "is it always this hot in Hawaii?" "You're lucky 'cruit, this is the middle of winter." "They should be so lucky in Minnesota." 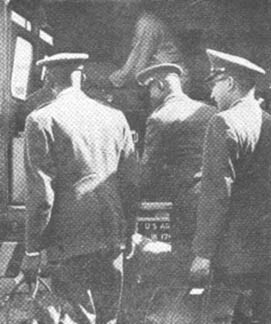 The men sagged from the weight of their duffel bags. Their uniforms showed the strain of being aboard a troop ship for six days. Their faces revealed the anxiety, apprehension and concern regarding their assignment to the Tropic Lightning Division. They reflected the "green" look of recent AIT graduates. "Stay loose Agular, you're number one getting off." Agular. Pvt. Guadalupe Agular. The first of 759 men to set foot in Hawaii. The largest single group of replacements to the famed 25th Inf. Div. in more than a year. He showed her photo around. He wiped the beads of sweat forming above his new six day growth on his upper lip. He thought a moment. "My first anniversary, almost to the day," Guadalupe said slowly. "One year, huh," a man said. So it went, down the line, from 26-year-old draftee Guadalupe Agular of Bracemont, Oklahoma, population 450 with four brothers and two sisters - to the guys at the end of the line from New York City with stories of their own to tell. Replacements. Primarily infantrymen, artillerymen and engineers. Brig. Gen. Edward H. de Saussure, ADC/S, 25th Inf. Div. mingled with the troops before they left the ship. "Who's he? " asked one. "How'd I supposed to know!" answered the other. "First one I ever seen this close." General de Saussure walked slowly from bow to stern to speak with the men. In groups and individually. "Good, we have a good program outlined here for you." "How about you soldier? You ready to begin doing a job?" "Have any idea where you're being assigned?" The general continued down the line. Conversation in the line was now sporadic. Bursts of conversation and then silence. "Glad to have you with us soldier, we're short of cannoneers." "Hope I can help general sir, even though I'm kinda short myself." The general looked down and smiled at the future Redleg standing no more than 5'4". "Where are you from soldier?" "Any jungles at Dix soldier?" "Don't worry, we have plenty around here." So the general continued from man to man, group to group, welcoming, encouraging, inquiring, stimulating and inspiring. "You men are damn lucky. This is one hell of an outfit." Jackson, Gordon, Polk, Sill, Dix, Knox, Leonard Wood, Ord, Sam Houston, Benning representatives now joining Hawaii's own fighting "Tropic Lightning." TONIGHT - "Father Goose" (F) Cary Grant, Leslie Caron. TOMORROW - "Planet of the Vampires" (F) Barry Sullivan, Norma Banguel. TOMORROW MIDNITE - "The Heroes of Telmark" (M) Kirk Douglas, Richard Harris. SUNDAY and MONDAY - "The Heroes of Telmark" (M) Kirk Douglas, Richard Harris. TUESDAY - "7 Women" (M) Anne Bancroft, Sue Lyon. WEDNESDAY - "Take Her, She's Mine" (MYP) James Stewart, Sandra Dee. THURSDAY - "The Loved One" (M) Robert Morse, Jonathan Winters. M - Mature, MYP - Mature, Young People; F -Family. TONIGHT - "A Hard Day's Night" (F) The Beatles. TOMORROW - "Master Spy" (F) Stephen Murray, June Thorburn. SUNDAY and MONDAY - "The War Lord" (M) Charlton Heston, Richard Boone. TUESDAY - "Come Fly With Me" (MYP) Karl Boehm, Hugh O'Brian. WEDNESDAY - "Dingaka" (MYP) Stanley Baker, Juliet Prowse. THURSDAY - "Dr. Goldfoot and The Bikini Machine" (F) Vincent Price, Frankie Avalon. TONIGHT - "Marnie" (M) Tippi Hedren, Sean Connery. TOMORROW - "Mickey One" (M) Franchot Tone, Hurd Hatfield. SUNDAY and MONDAY - " "Father Goose" (F) Cary Grant, Leslie Caron. TUESDAY - "Planet of the Vampires" (F) Barry Sullivan, Norma Banguel. TONIGHT - "Do Not Disturb" (MYP) Doris Day, Rod Taylor. TOMORROW - "Love and Kisses" (F) Rick Nelson, Jack Kelly. SUNDAY and MONDAY - "The New Interns" (M) Michael Callan, Stefanie Powers. TUESDAY - "Where the Spies Are" (M} David Nivens, Francoise Dorleac. TONIGHT - "Where the Spies Are (M) David Niven, Francoise Dorleac. TOMORROW - "Die, Monster, Die" (MYP) Boris Karloff, Nick Adams. SUNDAY and MONDAY - "The Reward" (MYP) Max Von Sydow, Efrem Zimbalist Jr.
TUESDAY  "Marnie" (M) Ti ppi Hedren, Sean Connery. WEDNESDAY - "Mickey One" (M) Franchot Tone, Hurd Hntheld. TONIGHT - "I'd Rather Be Rich" (MYP) Sandra Dee, Robert Goulet. TOMORROW - "A Swingin' Summer" (MYP) William Wellman Jr., Quinn O'Hara. SUNDAY and MONDAY - "A Hard Day's Night" (F) The Beatles. TUESDAY - "Master Spy" (F) Stephen Murray, June Thorburn. WEDNESDAY and THURSDAY - "The War Lord" (M) Charlton Heston, Richard Boone. LAST year while American forces fought in the Republic of Viet-Nam, the U.S. military engaged in dozens of other activities, many related to long-term peaceful projects. In the Navy's Sealab II men lived in and under the ocean for an extended period; while only months later, two teams of military pilots met briefly in orbit over the earth. Both of these projects dramatized the military's role in research for the future. When a hurricane made a destructive sweep through the Gulf states last fall, the military put on another hat, that of a trained and equipped disaster relief unit. All branches of the armed forces poured men and equipment into the area to assist those endangered by the storm and help restore order. 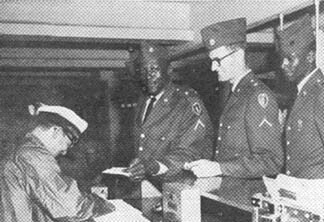 Thousands of American men and women in uniform serving outside the United States acted as roving ambassadors of friendship for our government and the American people. They were one of the major channels of export of American ideals and goodwill. 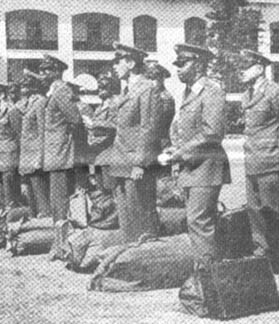 Registration began Wednesday for 24 United States Armed Forces Institute and locally prepared courses which will start at the Education Center West February 7, 1966. Registrations will be accepted at either Schofield Barracks Education Center on Mondays through Thursdays from 8 a.m. to 10 p.m. and on Fridays from 8 a.m. to 4:30 p.m.
Three of the courses, Practical English Usage I, Reading Improvement, and General Mathematics, are accredited by the Department of Education toward a high school certificate. There is no tuition charge for any of the classes and registration will continue through February 7. Courses will meet for five weeks. 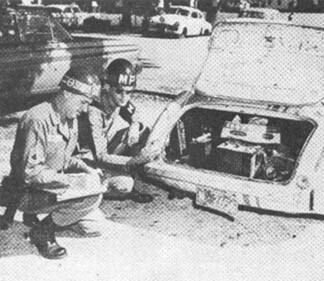 Applying the skills and know-how of a big city police department to the problems peculiar to the Schofield Barracks community, the military police of the 25th MP Co. and 38th MP Detachment have a long history of effective investigation and security protection. 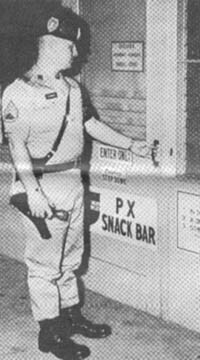 Comprised of four platoons and a headquarters section, the Schofield military police are responsible not only for the jobs with which they are usually associated - gates check, troop control, accident investigation - but also a variety of lesser known tasks. "Sneaker Patrols," automobile registration, beach patrolling, towing abandoned vehicles are all additional tasks that face the men who enforce the laws within the Schofield Barracks area. In a two-day period last week, 19 autos were towed to the impounding lot. Each auto was a big job in itself, as its contents have to be inventoried and an effort made to locate its owner. The vehicles record department of the Provost Marshal's Office insures that every vehicle on post has been properly registered with the State of Hawaii, has passed a safety inspection and is insured. The dependent housing section of Schofield Barracks has been a prime target of burglars and vandals in recent months. To combat this the MP's have been using sneakers instead of boots and a walkie-talkie system to patrol these areas. The "Sneaker Patrol" has proved effective with the element of surprise being the deciding factor. Lt. Col. George S. Black, the Schofield Barracks provost marshal, commenting on the MP's caliber of work said, "The military police on this installation are among the finest to be found anywhere in the United States Army." 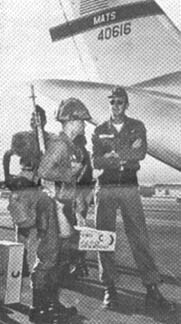 LIGHTNING INSPIRED - Maj. Gen. Fred C. Weyand, Tropic Lightning commander, offers words of encouragement to combat-clad men moments before their flight to the war torn country of Viet-Nam. 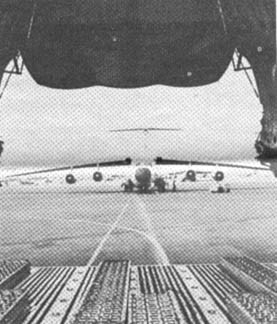 SET FOR RECORD FLIGHT - A C-141 "Starlifter" awaits takeoff, fully loaded with men and equipment of the combat-bound 3rd Bde, on way to record setting operation "Blue Light." LIGHTNING READIES TO STRIKE - With full combat gear Sp4 John Dewey, 3rd Bde, 25th Inf. Div. prepares to board a giant C-141 "Starlifter" at Hickam AFB enroute to combat duty in Viet-Nam. When the first troops of the 3rd Bde, Tropic Lightning Division landed last month at New Pleiku Airfield, they represented the first of a 4,000-man brigade on its way from Schofield Barracks thanks to "Blue Light," the longest and biggest airlift of cargo and personnel to a combat area in military history. For the past 25 days 200 tons of equipment and personnel of the 3rd Bde were transported daily to Pleiku, Viet-Nam, in a massive airlift by elements of the Military Airlift Command (MAC) at Hickam AFB. "Blue Light" under the command of Brig. Gen. Herman Rumsey and his unit, the 61st Military Airlift Wing, saw a total of 225 missions flown and 9,290,000 pounds of cargo transported in C-133 "Cargomasters" and C-141 "Starlifters" to Pleiku headquarters of the central mountain region, 240 miles northeast of Saigon. The entire operation was completed eight days ahead of the Tropic Lightning Division's required completion date and six days ahead of the MAC estimated completion date. The operation channeled heavy mechanized equipment and tons of guns, ammunition, food and other supplies to Pleiku. Gen. Howell M. Estes Jr., MAC commander, in a message to Maj. Gen. Fred C. Weyand, CG, 25th Inf. 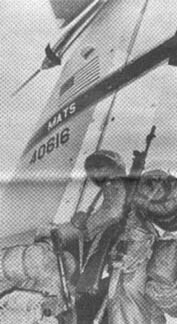 Div., said, "The record airlift of your 3rd Bde from Hawaii to Pleiku accomplished almost eight days before the Military Assiatance Command Viet-Nam target is a tribute to the splendid cooperation and smooth working relationship of our respective units. All of us in MAC are deeply impressed with this latest evidence of Army/Air Force teamwork in furthering the mobility of our fighting forces. Please convey my personal appreciation to all those in the Tropic Lightning Division who made this achievement possible. It has been a great privilege to work with them." 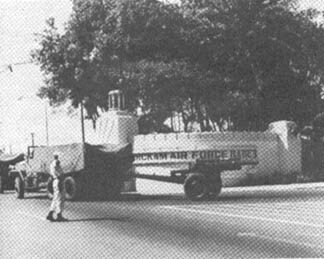 ENROUTE TO VIETNAM - Tropic Lightning deuce-and-a-half pulls a 105mm howitzer into Hickam AFB enroute to the 61st Military Airlift Wing's "Blue Blazer" area where the equipment was loaded aboard waiting C-133 "Cargomasters" and C-141 "Starlifters" for their 6,000 mile flight to Pleiku, Viet-Nam. 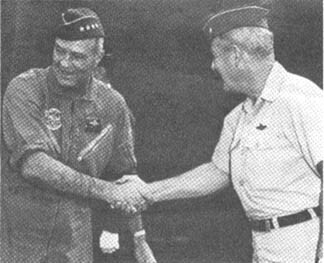 COMMANDERS MEET - Gen. Howell M. Estes Jr., commander of the Military Airlift Command, is welcomed to Hickam AFB by Brig. Gen. Herman Rumsey, commander of the 61st Military Airlift Wing. General Estes had just returned from personally flying a "Starlifter" mission to RVN. "Tropic Lightning Helping Hand" moved from the planning stages into action last Saturday as troops from the 25th Inf. Div. visited three Honolulu communities where they received two truck loads of donations from residents. 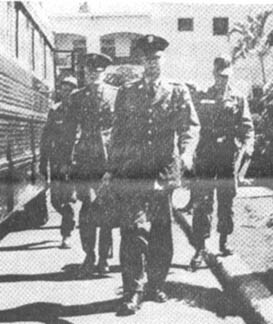 Accompanied by the 264th Army Band from Ft. Shafter, five division soldiers, who had recently returned from Viet-Nam, stopped at the community centers at Foster Village, East Foster Village and Aliamanu. 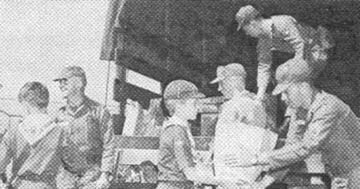 At each stop the band entertained the assembled residents while the children of the communities presented their gifts for the Viet-Namese to the men of the division. Division SMaj. Kenneth J. Leyden thanked the people for their generous participation in the program and answered questions the boys and girls had about Viet-Nam. The kids had been keeping up with the war. Questions like, "Is it rough? ", "How long will it last? ", and "What do you do for entertainment?" were fielded by the Sergeant Major. Items donated by the three communities included several tricycles, hundreds of children's books, cleaning materials, clothing, crayons, pens, pencils and towels. Over a ton of material was collected. At Schofield it will be consolidated with items donated by division families and other communities and packed and shipped to division units in the Republic of Viet-Nam for distribution to the Viet-Namese people. The "kokua" shown by the residents of the three communities visited on Saturday is greatly appreciated. Their donations will be a great help to the 25th Division soldiers in the accomplishment of their mission in Viet-Nam. Project officers for the community rallies were Maj. Bill Barrett at Foster Village, Lt. Col. Sam Ware at East Foster Village, and Mr. Sam Luke at Aliamanu. HELPING HAND continues in its drive to secure items suitable for use in the division's civic action programs in South Viet-Nam. Military and civilian communities in the State will be invited to help in this "bridge of friendship" between the people of Hawaii and Viet-Nam. The Tropic Lightning Division will serve as the bridge. Additional information may be obtained by contacting Maj. Willard W. Whiting at the 25th Inf. Div. 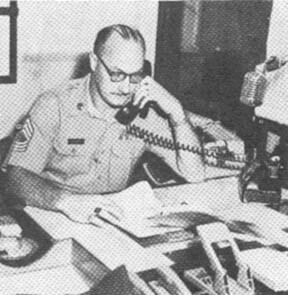 Information Office, 65-9616 and 65-0495, or Maj. Robert R. Hicks, (G-5), at 65-8225 and 65-9704. It is anticipated in the near future that the Schofield Barracks area will have a surplus of Government housing. In order to assure maximum utilization of Government quarters and fulfill the desires of some separated families to remain in Hawaii, the USARHAW housing policy is altered to permit dependents of personnel on PCS (Permanent Change of Station) to a restricted area to remain in Government quarters until the sponsor receives subsequent PCS orders or until the quarters are needed for other authorized personnel. If quarters occupied by dependents awaiting return of sponsors from PCS to a restricted area are required for other authorized personnel, occupants will be given a minimum of 30 days' notice to vacate. Persons who have already submitted application to remain in Government housing need not reapply unless they desire to remain in quarters for a longer period of time. Previous disapprovals will be considered upon resubmission. Requests will be submitted through HQ USARHAW to Commander, Schofield Barracks Area, indicating the period of time desired and reason. Applications should be submitted as soon as possible to assure prompt attention. Thirteen Tropic Lightning soldiers from the 3/13th Arty, 25th Inf. Div., were presented awards January 18, at Schofield Barracks. 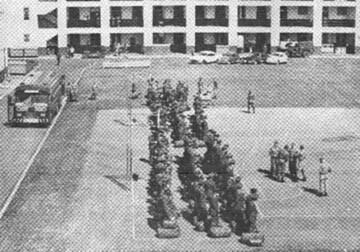 The awards, for outstanding performance of duty, consisted of seven Air Medals with Oak Leaf Clusters, three 25th Division Artillery Awards, three Letters of Commendation and the Battalion's Best Supply Room Award. 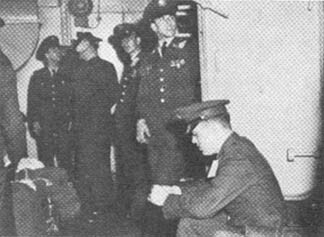 Battalion soldiers receiving the Air Medal and Oak Leaf Clusters from B Btry were, Sp4 James L. Kelly, his 11th Oak Leaf Cluster; Pfc Patrick B. Shea, 7th Oak Leaf Cluster and Pfcs James T. Phelan, 2nd Oak Leaf Cluster to the Air Medal. Also Pfc James E. Boehler, C Btry, 3rd Oak Leaf Cluster, Pfc Jim B. 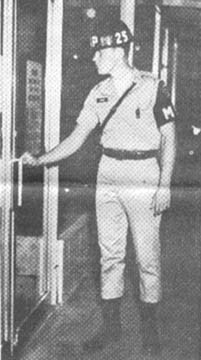 Merchant, C Btry, Air Medal with 1st Oak Leaf Cluster and Pfc Douglas L. Thompson, D Btry, Air Medal with 1st Oak Leaf Cluster. The 25th Division Artillery Award for Excellence for outstanding performance as a member of the "Cannoneer" football team was presented to Sp4 Glenn R. Callaghan, Pfc James J. Henry and Sp4 Thomas W. Wedge all of HHB. Members of the battalion receiving Letters of Commendation for participation on the DivArty football team were Bravo Battery's Cpl. 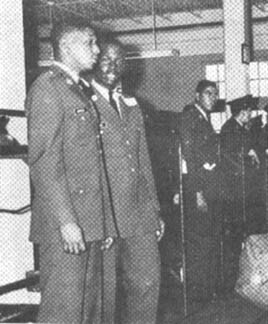 Henry Waters, Pfc Hershel D. Collins and Pfc Willie Campbell. SSgt. Donald G. Veile, Supply Sergeant, B Btry, was also presented the battalion's Best Supply Room Award. Lt. Col. Aaron E. Walker, battalion commander, made the awards presentation. Thomas D. Morris, assistant secretary of defense (manpower), visited the 2hh Inf. Div. Monday. Mr. Morris was picked up by helicopter and accompanied to Schofield Barracks by Brig. Gen. Edward H. de Saussure, where he was greeted by Maj. Gen. Fred C. Weyand, CG, 25th Inf. Div. 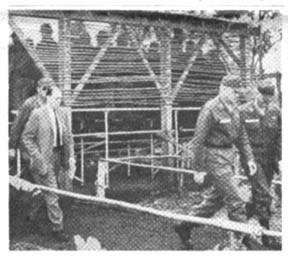 After a short conference with General Weyand, Mr. Morris was taken to the Tropic Lightning Division's Kara Village (pictured with General Weyand) for a demonstration. At Kara Mr. Morris, along with elements of the 7/11th Arty, observed methods of "Suspect Village Search" conducted by men of Hq. Co., 2/14th Inf. Mr. Morris attended a luncheon in his honor at General Weyand's home at Schofield Barracks, after which he conferred with Maj. Gen. Carl Darnell Jr., CG, USARHAW. Seven Tropic Lightning soldiers and three Camp Pendelton Marines graduated from the 25th Inf. Div. Language School at the East Education Center, Friday. Pfc Alan Laurence took top scholastic honors in the Viet-Namese language class with a 96.4 average. He was presented a Letter of Commendation from Maj. Gen. Fred C. Weyand, division commander. Other 25th Inf. Div. soldier graduates were: Sp4 Richard M. Hale, A Co., 1/5th Inf., Pfc Loren D. Tomblin,C Co.,2/14th Inf., Sgt. Jesus P. Valenzuela, Hq. Co., 1/27th Inf., Pfc Salvador Espinoza Jr., HHB, DivArty, Sgt. Frank E..Stever, HHC, V5th Inf. and Pfc Robert W. Zimmerman, A Co., 2/21st Arty. Marine graduates from Camp Pendelton were: SSgt. 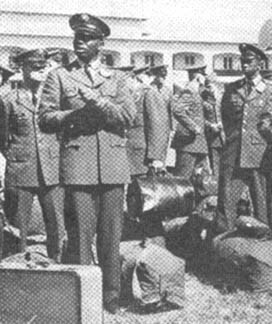 Huette D. Perkins and Sergeants Gordon D. Jennings and Sepp D. Ramsperger. Lt. Col. James W. Cannon, assistant chief of staff, G-2, spoke to the graduates. 5, 6, 12, 13, February 1966 Curtain 8:30 p.m. The Hawaii Lightning News is on authorized publication of the 25th Infantry Division. It is published weekly for all Army units in Hawaii by the Information Office, 25th Inf Div, APO Son Francisco 96225, with a circulation of 7,500. Views and opinions expressed are not necessarily those of the Department of the Army. All pictures are official U. S. Army photographs unless otherwise designated. Printed by Kemoo Stationers. This newspaper receives Armed Forces Press Service, Army News Photo Features and Army News Features materials. ON THE GO - The Army Redlanders, winners of the Hawaiian Armed Forces Senior Invitational Basketball League championship, departed Honolulu International Airport, January 20 for Okinawa where they participated in the Pacific Area Army Championships Tuesday, Wednesday and Thursday (Complete results not available at press time). The Redlanders, representing Hawaii, met All-Star teams from Japan, Korea and Okinawa in round-robin play. This is the fourth in a series of six articles on dental health published by the Hawaii Lightning News in cooperation with the Schofield Barracks Dental Clinic in observance of National Dental Health Week, February 6-12. What causes gum disease? Can children have it? I have been told that my daughter has a disease called gingivitis, and I was wondering if this is the same thing as adults have. Gum disease is caused by several factors, and our research in. this area has not as yet pinpointed all of the specific causes. However, we do know that a primary factor in periodontal (gum) disease is bacteria. The bacteria in the mouth unite with food particles and saliva to form a hard, crust-like material called calculus which clings to the teeth. This substance collects more bacteria, which eventually irritate the gums. As the gums become infected they begin to recede and leave pockets of infection which continue to destroy the tissue. As the disease progresses, not only the gums are destroyed but the underlying tissue and bone as well. It is at this point that the teeth become loose, and it often becomes necessary to extract them. Gingivitis, the beginning of gum disease, can be found in people of all ages. If left untreated, it can lead to more serious disease, as the process I have described takes place Thus it is important that your child receives a checkup now. My dentist says I have periodontal disease. He cleaned my teeth and showed me a special method of brushing my teeth and gums. Then he said I should return for a checkup in a month. Would you tell me more about the treatment of this disease? There are a number of methods that we presently use in treating diseases of the gum-periodontal disease - and the one your dentist prescribed is quite common. The cause of periodontal disease is described in the previous answer. Home care and regular dental care are of primary importance in preventing and controlling gum disease. A more complex treatment method is sometimes required. This involves the surgical removal of diseased gum tissue and cleaning the teeth thoroughly. With the removal of the diseased tissue and other therapeutic measures, the remaining healthy tissues become firm and stop receding. This treatment is reserved for severe cases of gum disease. And, again, good oral hygiene must be continued to maintain the gums in good condition. You must remember that the best "cure" for any disease is often prevention. Because gum disease is responsible for more tooth loss after the age of 35 than is decay, it is important that these dental health habits begin at an early age. The American Dental Association estimates that nearly 50 per cent of all youngsters have some form of gum disease requiring treatment. Have you taken advantage of a free dental appointment for a cleaning, polishing and topical fluoride treatment? This is a service offered to dependent children between the ages of 4 through 19 by the Schofield Barracks Dental Clinic. Call for an appointment every six months and help prevent decay as well as periodontal problems. Note: Preventive dentistry treatment for children in the Schofield Barracks area has been temporarily suspended. This treatment will be resumed sometime after February 1966. 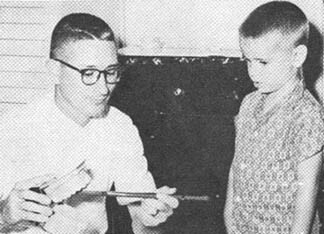 CORRECT - Sp5 Robert D. Davis, an oral hygienist at the Schofield Barracks Dental Clinic, demonstrates the proper method of brushing teeth to Wayne Miller Jr., son of Capt. Wayne R. Miller, CO, HHT, 3/4th Cav. USARHAW, Education Section of Morale and Services Division has initiated a program whereby dependents are afforded the opportunity of furthering their studies during their stay at Schofield Barracks. The proposed new program would provide educational and vocational counseling, achievement and diagnostic testing and group study instruction. Arrangements have been made with the Department of Education to provide instruction in academic courses on the elementary and high school level and home economics courses in the field of food, clothing, parent education, house and home furnishing, family management and relationships. Under the terms of the agreement, Department of Education would pay the cost of instruction and the Army would provide classroom facilities as well as administrative support to include assistance in recruiting instructors for this program. There will be no tuition charge, although dependents enrolling in high school level courses will be required to purchase their own text books and students in some home economics courses will have to purchase some of the supplies used in course instruction. At this time, other community resources are being explored such as the University of Hawaii and service groups, to provide for the expansion of the program, if warranted. Hostile fire pay for service personnel stationed outside the Republic of Viet-Nam, but serving one or more short duration temporary assignments there, has been clarified. Anyone ordered temporarily from home station to the combat zone (RVN, contiguous waters thereto and air space above) for a "combat" operation qualifies. Other personnel on short duration assignments must serve in-zone at least a part of each of six days during a calendar month, or serve six consecutive days, which may overlap from one month's end to next month's beginning. Persons temporarily in-zone also qualify if exposed to hostile action placing them in danger of being wounded, injured or killed. As in the past, uniformed personnel assigned in-zone for 30 consecutive days or more receive regular monthly $65 hostile fire payments. Playing their last game before leaving for the USARPAC championships in Okinawa, the Army Redlanders dropped a 107-94 decision to the Santa Clara Broncos at Bloch Arena January 18. The Broncos gave away almost three inches per man in height but anything they lacked in height they more than made up for in shooting ability. Hitting 79 per cent of their shots in the second half, the Broncos overcame a one point deficit and won going away. The Redlanders lost the tip and immediately fell behind, to the running-gunners from California, 19-11 with only six minutes gone in the game. 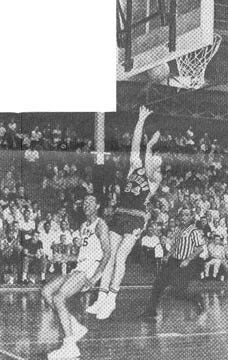 Then the league champions started playing the brand of ball that carried them to 18 victories during the regular season and outscored the Broncos 19-3 over the next six minutes. 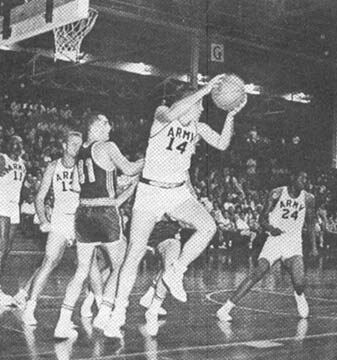 The two teams traded buckets until the Redlanders gave the Broncos the ball twice on turnovers in the last 40 seconds and the half ended with the Army five in front by a 49-48 margin. ln the first half the Redlanders were led by Terry Dischinger with 15 points and Henry Davis 11 points and eight rebounds. To open the second half Henry Davis hit from the corner to give the Redlanders a three-point lead but then the Broncos started running and opened an eight -point lead with 14 minutes remaining in the game. Although the Redlanders closed to within three points with six minutes remaining, the fast moving Broncos pulled away and outscored the Army 15-6 in the last three minutes of play. Henry Davis finished the game with 19 points and 17 rebounds while Dischinger led all scorers with 31 points. Dean Keeton, the Redlanders' starting forward, pulled a muscle in his left leg and played only five minutes of the first half and sat out the whole second half. SNARED - Dave Bankert, fast moving, Redlander guard picks off a rebound and heads up court in recent Army-Santa Clara clash at Bloch Arena. UP AND DOWN - James Washington (10) goes up as the ball comes down while teammate Henry Davis sets up for low rebound. 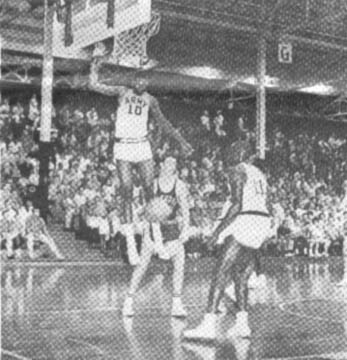 LADDER - An unidentified Santa Clara player looks as though he is getting a boost from the Redlanders Walter Hanks as he scores on driving lay-up. All tennis players interested in playing on the 14th Naval District Tennis team in the Honolulu Class "C" tennis league, contact LTJG Forrest Wright, phone 14946. As many as 18 players may be placed on the team roster. Each match will consist of 3 singles and 5 doubles matches. Matches will be played on Sundays, commencing the first Sunday in February and continuing for approximately 8 weeks. First practice will be held at 2 p.m., Sunday at the Beman Center Tennis Courts, Submarine Base, Pearl Harbor. First and Second Round Results in USARPAC Basketball Tournament. Ripper Collins, the new Hawaiian Champion and his Valet, Beauregard, will meet Lord "Tally Ho" Blears and Nick Kozak in an one hour time limit, two out of three falls Professional Wrestling Match at Conroy Bowl, February 6 at 8 p.m.
Collins, who won the Hawaiian championship from Luther Lindsey in early January, will be meeting the U.S. Heavyweight champion in Kozak who has held his title for four months. In the first match of the evening Nick Bockwinkel, the man of a 1,000 holds will meet the Golden Terror from parts unknown in a one fall 30 minute time limit match. The main event of the evening will feature Hawaii's Golden Boy, Neff Maiava, in an one hour time limit, two out of three falls match against Handsome Johnny Barend. Admission is one dollar and the public is invited to attend. While their senior counterparts were off to Okinawa for the USARPAC Basketball Tournament the Schofield Redlanders entry in the Hawaiian Inter-Service Youth League kept the winning fire going with a 51-42 victory over the Kaneohe Marines last Saturday at Conroy Bowl. Eight members of the Army team hit the scoring column in a great team effort that saw the Redlanders ahead 48-27 after the third quarter, at which time coach Bobby Yawn sent in his replacements to hold off the Marine charge in the final stanza. After the general's remarks a brief history of the famed World War II and Korean War jungle and guerrilla warfare trained division was presented by Maj. Willard W. Whiting, command information officer. The new men spent their first few days in the division processing through personnel services teams. After receiving OJT the soldiers will be assigned to jobs utilizing the open MOSs found within the division. Assignment to units was accomplished before the men arrived. Management branch personnel spent the weekend pouring over the soldiers' personnel records. 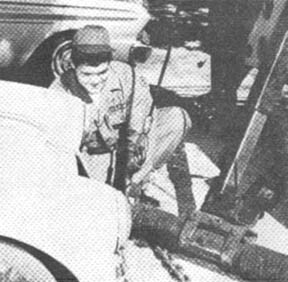 Civilian jobs, education and test scores were studied before each man was assigned to a unit. Each division unit requires men with varying abilities and skills. Military policemen, for instance, must meet height, weight, and age standards. Several of the men are being assigned to the 125th Sig. Bn. for training as radio operators. These men showed above average scores on their code tests. Some had electronics experience. More than 500 of the new soldiers will be assigned to the infantry, artillery and engineer battalions of the 25th Inf. Div.